Black Mount Logging Inc. from Squamish, BC, has applied to the Ministry of Forest, Lands and Natural Resource Operations (MFLNRO), Surrey for a License of Occupation for Log Handling and Storage situated on Provincial Crown located at Folger Creek in Howe Sound. A log dump, a location where a logging road meets the water and logs are dumped into the water, is proposed to be build north mouth of the creek. The location can be viewed on the maps that were submitted with the application. This is a proposal for a 10 year Licence of Occupation for a log dump in the Folger Creek area. The site will be accessed by the water or network of forest roads. Infrastructure may include reconstruction of previous dump facilities, installation of floating dump skids, installation of booming grounds, installation of a dock and barge ram, and installation of three anchors in the water. Although the company is applying for a log dump at the end of an existing logging road (built during last century logging), the BCImap site does not show any pending cutblocks in the Folger Creek watershed. It is very unlikely that the company applying for the log dump and the agency reviewing the application are aware of the herring spawn at this location, and the areas adjacent, as we have just started providing detailed information about the spawn locations. 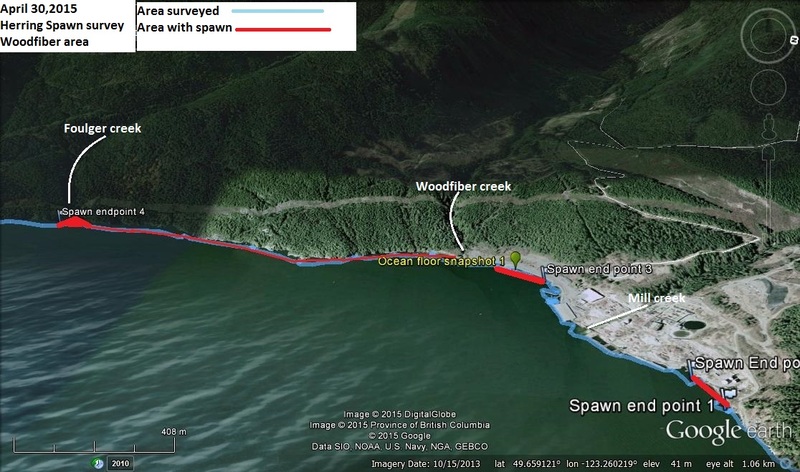 If the logdump were to be built at the proposed location it would destroy existing habitat for Herring spawn, and possibly kill Herring due to soil, and oil- and grease residue (from logging equipment) entering the water at the site. Why is there a need for a log dump to be build if no logging plans have been submitted for the Folger Creek watershed to the Ministry of Forest, Lands and Natural Resource Operations. And if such logging plans were submitted, to have the log-dump moved to a location where Herring spawn would not be put at risk. Video of Herring Spawn at Folger Creek showing extreme thick spawn. Take notice that Black Mount Logging Inc. from Squamish, BC, has applied to the Ministry of Forest, Lands and Natural Resource Operations (MFLNRO), Surrey for a Licence of Occupation for Log Handling and Storage situated on Provincial Crown located at Folger Creek in Howe Sound. 2) By mail to the Senior Land Officer at 200 – 10428 153rd Street, Surrey BC V3R 1E1. Comments will be received by the Ministry of Forest Lands and Natural Resource Operations until January 15 2016. Comments received after this date will not be considered.